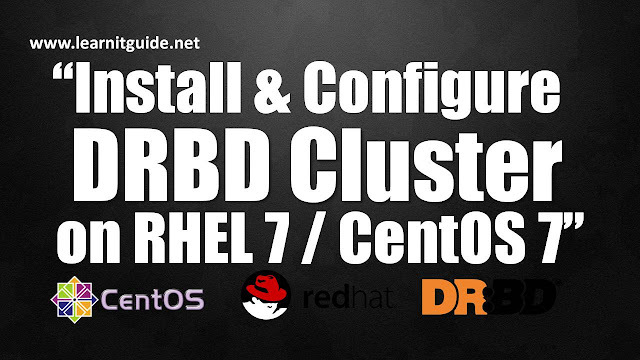 This article explains you the step by step procedure of How to Install and Configure DRBD on RHEL7 / CentOS7. In the previous post, we have explained about the DRBD (Distributed Replicated Block Device) to understand What is DRBD (Distributed Replicated Block Device), How the DRBD Works, DRBD Operations, DRBD Replications modes, DRBD Architecture and DRBD Administration commands. 2. Dedicated Local disk on each nodes (/dev/sdb and preferably same size). 4. Yum repo enabled, refer this link to configure yum repo server. 1. Download DRBD and Install the DRBD Packages. 3. Initialize the meta data storage on each nodes. 4. Starting and Enabling the DRBD Daemon. 5. Enable the DRBD Primary node. 6. Create and mount the Filesystem of DRBD device. Before installing, find the available latest version of DRBD to install using yum. If it is not loaded, find the drbd.ko module using find command and install it. By convention, /etc/drbd.d/global_common.conf contains the global and common sections of the DRBD configuration, whereas the “.res” files contain one resource section each. Create a file system, mount the volume and write some data on first node "node1"
Lets test the configuration by changing primary mode "node1" to second node "node2" to check the data replication works or not. Unmount the volume drbd0 on First node "node1". Change the primary mode to secondary mode on first node "node1"
Change the secondary mode to primary mode on second node "node2"
Yes, we could see our data written on node1 disk is successfully replicated to node2 disk. Thats all about the DRBD Basic Configuration. Refer this link to see, how to integrate this DRBD data replication with Pacemaker clusters.